This past summer my family and I had the opportunity to spend a great week at a beautiful little cottage on a nice lake. Every morning I’d wake up just after sunset and head out onto the patio for my morning coffee and to watch the waves roll in. I wasn’t the only one out there on the patio though, as each day my little chipmunk friend would join me. The reason he was there was to try and pick up any crumbs I dropped from my morning toast. Perhaps the only thing he loved more than scavenging for some crumbs was scuttling up his tree when I was finished eating. This tree had a lot of branches that had snapped, presumably in a recent storm, and I couldn’t help thinking that it could use a good pruning. For this type of job a powerful chainsaw probably wouldn’t have been necessary, but something like the WORX WG320 Max Lithium Cordless Jawsaw would have been ideal. This is a green and safe alternative to traditional chainsaws and, perhaps best of all, it’s quite affordably priced at less than $200. The WORX WG320 is capable of providing a much cleaner cut than traditional chainsaws. This is because it’s jaw sawing action attacks the cutting job from two sides at once. A traditional chainsaw always cuts from the top down and often results in some breakaway splinters towards the end of the cut. The end result can be quite messy and can be potentially dangerous when you have to handle the wood. If you like to do your little bit for the environment you’ll be happy to know that this chainsaw/jaw saw is powered by a lithium-ion battery. That means you don’t have to worry about emissions because it doesn’t produce any, and you don’t have to worry about breathing in any noxious fumes either. The other great thing about a battery-powered chainsaw is that it’s much quieter than gasoline-powered chainsaws. The jaw saw design does use a much shorter blade than a traditional chainsaw, but it does still have a chain that can become loose over time. You won’t have to worry about making manual adjustments to the chain’s tension, though, as it has an automatic chain tensioner that takes care of this task for you. It’s a convenient and useful feature that’s designed to make your life a little easier. As is the case with many other chainsaws we review on this site, this model has an automatic oiler built into its design. While that doesn’t make it stand out, what does make this machine stand out is that it has an oil level indicator so that you know when to replenish your supply. An automatic oiler doesn’t do a lot of good if there is no oil in the machine and so this is a great added feature to have. The jaw saw design of the WG320 does have some flaws and isn’t ideal for larger cutting jobs, but where it does shine is in its attention to safety. By creating a design that incorporates a set of jaws, the manufacturer has been able to minimize the potential for any kickback. In the event that the machine does kick back there’s almost no chance that you’ll be cut by the chain as it’s protected by a plastic guard on both sides of the jaw. If you’re a bit of a klutz like me, having that bit of extra protection built in to the design is a welcome extra safety feature. For the past hundred years or so steel has always been considered one of the strongest types of metal that we can use in our tools. While there may be other options these days it’s still a material we associate with strength. Steel is durable and strong and that’s why Worx has used it in designing the teeth for the jaws of this product. They’re designed to hold the piece of wood you’re cutting in place, for extra added stability and a nice clean cut. A battery-powered chainsaw isn’t the only environmentally friendly option out there – you can also opt for a corded electric chainsaw. The corded electric chainsaw will always have a reliable power source, but you will have to deal with that cord that’s always in the way. You don’t have to worry about that with the WG320 as its battery doesn’t have to be plugged into anything, except for when it needs to be charged. When fully charged this machine is more than powerful enough to get the job done, so you won’t really sacrifice anything by not using a cord. One of the biggest problems that people have when using chainsaws is that they can be quite heavy. Many gasoline powered chainsaws weigh more than 25 pounds and that’s a lot of extra weight to carry around with you as you work. The Worx WG320 Jaw Saw is one of the lightest chainsaw alternatives you’re likely to come across. This handy little tool weighs in at less than 8 pounds, which makes it easy to use and a lot less taxing on the body. This battery-powered jaw saw is a popular tool with some positive reviews, but not everyone’s had a positive experience with this machine. It seems the most common complaint people have had with this saw is that the chain has a tendency to come off from time to time. That would likely be a little annoying if you’re in the middle of a tough cutting job. Fortunately, it doesn’t seem to be a problem that most purchasers of this product have run into. 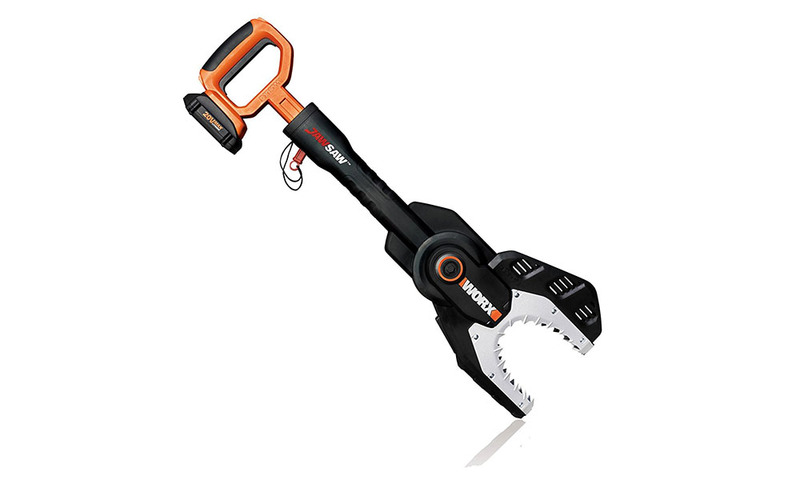 While I probably wouldn’t purchase the WORX WG320 Max Lithium Cordless Jaw Saw as an outright replacement for a traditional chainsaw, it does seem like a nice complementary tool. This little saw creates clean cuts and is ideal for smaller pruning jobs where a chainsaw may seem like overkill. It is a bit of a concern that some purchasers ran into issues with the chain falling off somewhat frequently, but it doesn’t seem to be an overly common problem so I’d probably be willing to take a chance on it.